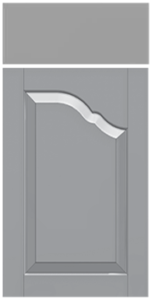 The HL/HR-90 (Half Left / Half Right) door is basically half of the arch of the CRP-90 door. Left/right/paired must be specified. This is not a door to use in your whole kitchen, but is a great choice on select cabinets to accent certain focal points of the kitchen. The cross-section below is an example only. Profiles you may choose will affect final look. Of all the cathedral doors, this design is the most troublesome for narrow width doors or short height doors. 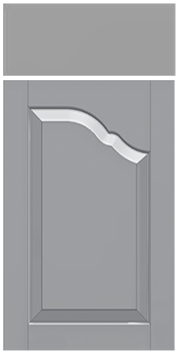 Plan your design carefully and be mindful that short doors on cabinets such as an over-fridge or ove-micro cabinet that may be only 12″ tall will not be available with the CRP90 design. Similarly, narrow doors like those on a 9″ wall or base cabinet will not be available in the CRP90 as the panel would come to a point. Our design professionals can assist you in planning your design to allow for this beautiful door if you choose it.